It was the second time I had left Wales to set up home near London when, in 1999, I came to live in Hemel Hempstead. I settled in Alexandra road near the old High Street, which reminded me of the old market town I’d left. A favourite walk in my first weeks was along the Old High Street and around Gadebridge Park. What beautiful trees! It reminded me of the one in the town where I was born. There, for four decades of my life, the river Afon Llwyd “sludged” under the wooden bridge near the Italian gardens, choking our Pooh sticks. Then a wonderful change! Coalmines were closed, the river was cleared and fish could safely swim! 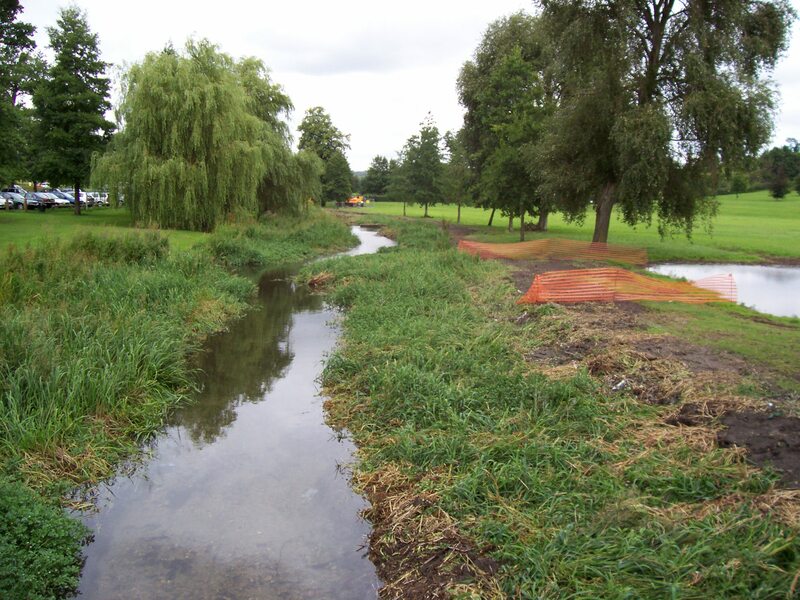 What a difference in Gadebridge Park were the river to be cleared! The shopping centre is good for a town of its size, the significance of the statues and murals not immediately understood but another reason for delving in to Hemel’s past. I’ve lost count of the changes in shops.”4 your Home” is the third retail outlet on the site in four years! But that’s the way it goes in towns today. I welcome the planned arrival of a large department store. I look forward to the new bandstand too. Music while you shop is preferable to shop till you drop. The water gardens are best appreciated at dawn when traffic is at a minimum! But it is an oasis of sorts from the hustle and bustle. An attractive feature- – – ducks and geese never cease to fascinate me and others. In 1999 I remember searching for a teashop. Fast food and takeaways galore! In four years the scene has changed. The Mall centre has a larger eating area even a café between the escalators, and so many places to dine out! I’ve seen the Pavilion demolished and the plans to redevelop the site! But the Old Town Hall has benefited from refurbishment. Reading local papers I came to realise Hemel Hempstead is made up of small communities each with its hall, shops, schools, church and green areas. Green areas where people can sit and children can play. These areas are the saddest and most disgusting feature of Hemel. Why? Litter-with a capital L. As a retired active person I find Hemel a good place to live. There are a wide variety of interests to follow, and other rural and urban places accessible by public transport. People are friendly and welcoming. I haven’t met many native Hemel people but when I do, I love to hear what was once standing where now something else does! People obviously came from many parts of the U.K. to the new town post war years. In this past year I have noticed more ethnic groups, different languages overheard when shopping. Like many towns in the 21 st Century Hemel Hempstead has become cosmopolitan. This page was added on 04/07/2012.